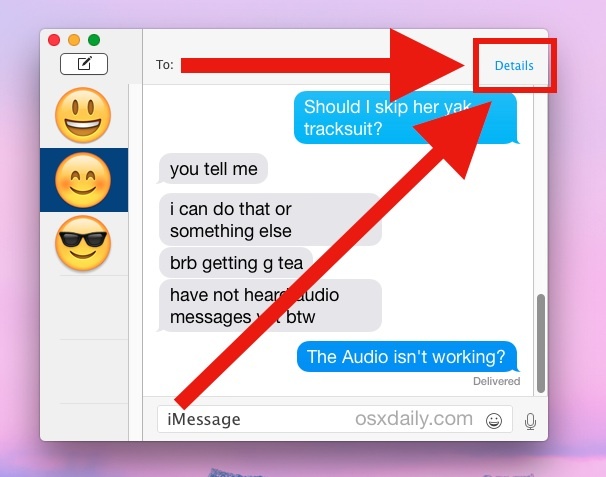 With the Mac Messages app able to send and receive text messages along with iMessages, you’ll be in greater contact with friends, family, and anyone else who sends you a message. This is usually a good thing, but sometimes you’ll find yourself as a recipient to a conversation that just isn’t necessary to follow. For example, maybe you’re an unintentional third party on a multi-person conversation, and frankly you have nothing to add to the conversation. In situations like these, you could always enable system-wide Do Not Disturb mode with a schedule or quick-click, but perhaps a more appropriate option is to selectively mute the conversation in question. The message is signified as muted / Do Not Disturb with the familiar little moon icon from the system wide DND feature in iOS, which will appear next to the users name and avatar icon in the Messages conversation window sidebar. The user that is muted will have no indication that they have been muted, and you can still respond if you want to as well. 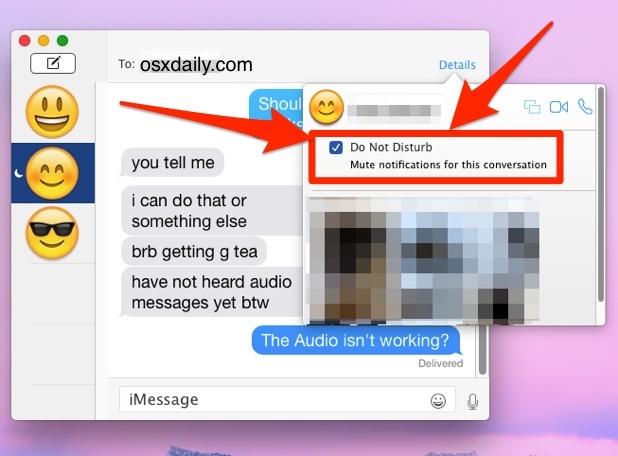 By the way, if you’re getting pelted by a barrage of messages, you may also want to mute the same conversation in iOS too using a similar trick on the iPhone and iPad. To un-mute the conversation, simply click on “Details” and uncheck the “Do Not Disturb” box again. Don’t forget to do that, otherwise you may wind up in a situation where you think something is wrong when it isn’t, a common occurrence on the iPhone in particular. Earplugs are the “Do Not Disturb” for the real world, if that’s too obvious, wear headphones that play music from the iPhone. All the time. That’s what I did when I was in a cubicle before I got the office, just had headphones on constantly. Most people talk way too much, and it’s rarely about something anyone wants to hear. Or just crunch a lot of potato chips, sorry honey can’t hear you my mouth is full of potato chips all the freakin time, love you too sorry hon these chips are just great crunch crunch. When you mute a conversation, do the notifications still come up or do they just come up silently? When you mute a conversation, how do it appear to them? Do their message says “delivered” or nothing at all? I’m asking because I think I am being muted by someone. My imessages (both using iphones) don’t say delivered but then all of a sudden indicates they were read.